This classic short sleeve polo shirt knitted in 2-ply cotton pique has an embroidered chest logo. A special finish enhances softness, shape retention and resistance to shrinking, fading and pilling. Side vents. Extended back hem. Machine wash. available from Brooks Brothers. 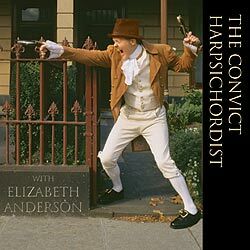 The performance The Convict Harpsichordist at City of London Festival 2001 was made possible through the generous support of this lodge. Frustrated in love, John Grant shot a London lawyer and was sentenced to death at the Old Bailey. Granted a reprieve, John Grant arrived at Sydney Cove in 1804, bringing with him Australia's first harpsichord. The performance included This Beauteous Wicked Place, a newly commisioned work composed by Ron Nagorcka for harpsichord, didgeridoo and Australian bush sounds symbolising the reconciliation of two cultures. Ron Nagorcka is not only a didjeridu virtuoso, but is one of Tasmania's most important and distinctive contemporary composers. Armed with his digital sampler, Nagorcka is able to not only draw upon the sounds of the local wildlife and countryside but combine them with extraordinary electronic manipulation and Pythagorean just intonation. This Beauteous Wicked Place has been recorded and is available on The Convict Harpsichordist, Devils of the Night and Bizarre or baRock Volume 2. Since Brother Joseph Banks first stepped ashore with Captain Cook in Botany Bay, freemasons have played a vital role in Australia. Sir Joseph Banks was initiated into freemasonry in a lodge meeting at a Golden Fleece tavern. The Lodge of the Golden Fleece 300 meets at East Melbourne on the second Friday of February, March, May, July, September and November. 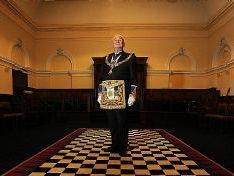 Grand Master of Freemasons Victoria, Vaughan Werner said Freemasons had made a concerted effort to be more open with the community, when they opened the doors of the newly refurbished Williamstown Masonic Centre to the public in October 2011. "We have to open our doors to be a viable part of a community," said Mr Werner, a former assistant commissioner with Victoria Police. "We will give people the truth about Freemasonry"
"Freemasonry has stood the test of time and it is no surprise that young men are arriving at our door after searching for something more meaningful in life. What we have always known is that Freemasonry offers opportunities for men looking to better themselves, personally develop, serve their communities, grow spiritually and live a principled way of life." The glazed design forms part of a strategy to adapt the perception of freemasonry within the community, with a view to developing a more open culture. The building shows how modern architecture can creatively blend with the old. The original Lodge room was constructed over a century ago. A modern supper room and kitchen facility is all 21st century. The first records of Masons in Hobsons Bay were in 1853 when they met in hotels. Mr Werner said the refurbished Williamstown Masonic Centre, originally built in 1891, would become one of the most iconic buildings of freemasonry in Victoria. All areas of this site are available to public view. In addition to the various informative videos available on the site, you can view or download a pdf file of a booklet, which contains a fascinating insight into Freemasonry. Your questions answered about the principles, history, lodges and facilities of the United Grand Lodge of England. Freemasons' Hall is one of the finest Art Deco buildings in England. The building is fully open to the public and the perfect setting for a range of events, including the Hitchhikers Guide to the Galaxy film premiere party and Monty Python's Spamalot opening night party. The United Grand Lodge of England is forging links between well placed, enthusiastic Lodges and the many men who are seeking to become involved in freemasonry but who may not know where to begin. Freemasonry is all about enjoyment. If members did not enjoy lodge, they would not remain part of the organisation in the way that they do. "The Future of Freemasonry provides an insightful commentary, not just on the organisation, but also on modern society. Despite the many changes taking place, or perhaps because of them, our desire to be part of something and to help other people is undimmed. It's here that Freemasonry has an important part to play." said Peter Marsh, co-director of the highly respected Social Issues Research Centre. The first ever independent study conducted by a non-Masonic body found that Freemasonry demonstrates genuine openness and transparency. As well as instilling in its members a moral and ethical approach to life, including thoughtfulness for others, kindness in the community, honesty in business, courtesy in society and fairness in all things. Freemasons are the largest charitable givers after the National Lottery. is an ancient and respectable institution, embracing individuals of every nation, of every faith and every condition of life. can be defined as a benevolent, charitable, educational and ethical society. strives to teach every moral and social virtue and exhorts its membership to practise the universal principles of brotherly love, relief and truth. Freemasonry is a worldwide organisation comprising men of goodwill from across the whole spectrum of race, nationality, religion and politics. The teachings of Freemasonry are comprehended in the three great virtues of Brotherly Love, Relief and Truth. At the same time, our members hold dear their citizenship of their country and the responsibilities which this attachment implies. Service to the community has thus been a hallmark of Freemasonry over many generations and continues to motivate us both corporately and as individuals. It is not Freemasonry, but the individual Mason, instilled with the principles and tenets of the Craft, who has a positive influence on society. 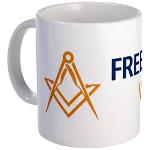 The most widely recognised symbol of freemasons is the square and compasses. Freemasons are expected to practice outside the Lodge those duties and virtues they are taught inside the Lodge. In regular freemasonry, these duties and virtues are discovered by reading and understanding the English Bible, a copy of which is open at every lodge meeting. Freemasons are encouraged to make a daily advancement in knowledge. The goal of every freemason is charity; "the stranger that dwelleth with you shall be unto you as one born among you, and thou shalt love him as thyself". Freemasonry adopted the Renaissance ideal of friendship: that each is as watchful and caring for the other as for a second self, and that neither will flatter or mislead but only speak the truth to the other. Building on the foundation created by the study of Greek and Arabic works of natural science, philosophy and mathematics, Renaissance scholars began the process of recovering and studying Latin and Greek literary, historical, and oratorical texts. In 1762 the Royal Artillery Band was formed in Germany moving to Woolwich the following year where it has been in residence ever since. It is a State Band, the only Army band able to support a full orchestra and as such is the oldest orchestra in England - military or civilian.